The Weston Single Hamburger Press will allow you to create perfectly sized, pressed, and portioned burgers any time with your own ground meats! Making your burgers yourself also allows you to season them exactly to your taste! Perfectly formed burgers eliminate 'fat' burgers that are undercooked in the center, and 'thin' burgers that fall apart when you try and flip them. Non-stick Teflon coated surface keeps patties from tearing apart. This is the fastest, easiest way to make hamburger patties for a weekend cookout or to stock the freezer! It creates a perfect, uniform patty every time. Simply place ground meat on a restaurant-grade paper sheet in the press. Put another sheet of paper on top, and press down firmly. Patty weights conveniently marked to keep your patties the same size, every time! 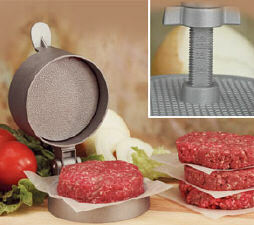 The spring-loaded, patty-pressing design compacts the patty tightly, so your patties will not fall apart on the grill. Adjustable patty thickness up to 1-1/2"
Pre-made patties can go right from the freezer to the grill without thawing. Measures 5.5 X 7 X 4.5"